Ready to engage in battle? 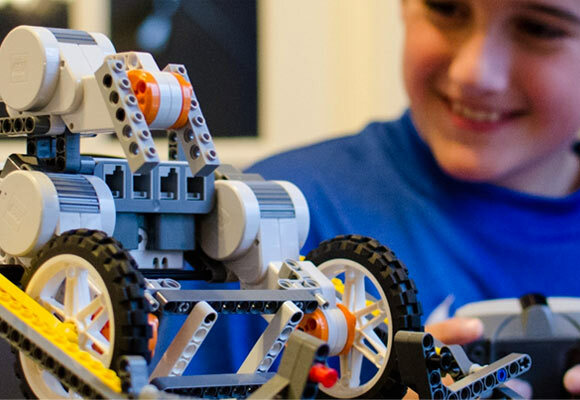 Register for this class and you’ll learn how to built the ultimate BattleBot using using LEGO® Mindstorm robotics. Then, test your bot’s capabilities when you pit it against your fellow participants in a head-to-head, sumo-style battle. Your objective? Push your competitors’ bot out of the ring to declare victory! Register today for one of two age groups. *Registrants ages 5-8 are required to have an adult chaperone attend with them. Financial assistance may be available for families who cannot afford the full cost of LEGO® BattleBots registration. Please call 775-398-5954, or e-mail financialaid@nvdm.org for more information. LEGO® and DUPLO® are registered trademarks of the LEGO® Group of companies which does not sponsor, authorize or endorse this program or web site.